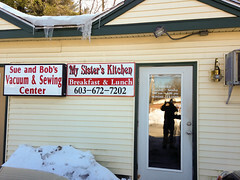 My Sister’s Kitchen opened up in 2011 in a little strip mall on the western side of Milford on the Elm Street. And the main ethnicity of My Sister’s Kitchen is…. Russian. Yup, a Russian-influenced place in small town NH. 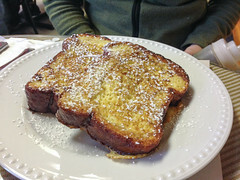 It’s a fairly small and cozy place with only 4-5 tables, but they’ve got quite an extensive breakfast and lunch menu with a mix of American diner and Russian fare, so there’s a bit of everything. 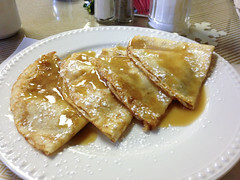 For example, the breakfast menu runs the gamut from traditional diner fare like French toast and hash, into classic Russian fare like blini (thin almost crepe-like pancakes). The lunch menu similar includes sandwiches and burgers…. as well as pierogi and golabki. So it’s quite the menu, especially since they seem to serve breakfast all day (while nominally having “breakfast hours”, they were more than happy to serve up breakfast items when we arrived at 11am). Being “brunch” when we arrived, we both opted to check out the breakfast menu. Carol went for the French toast, while I was unable to resist ordering up some blini with caramel sauce, and a side of corned beef hash. A few minutes later, our food arrived. Carol’s French toast was rather pleasant French toast: a proper French toast in which the bread is soaked in egg/milk mix but still reasonably firmed, and fried up to a crisp (in contrast to a lot of places that seem to now serve a “French Toast” that’s basically battered-and-deep-fried bread). A good start to the breakfast. The blini were next, and these were sublime. The blini themselves with nice, thin, crepe-like layers, cooked to a perfect consistency that was both slightly chewy but well-crisped. I’d be happy with these by themselves, but topping them with a very nicely done caramelized sugar syrup make for a delicious confection. I’d get this again. The hash was our final dish, and here they performed solidly as well. All too often hash at a diner is (a) out of the can, or (b) house made, but still a close facsmile of the canned stuff. 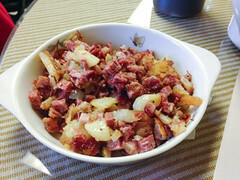 Here, they’ve got it dialed in, with nice moist bits of corned beef, onion, and potato all mixed together in a mix that’s fried just to the point of crispness, this is one of the finest hashes in the area. Overall, My Sister’s Kitchen is a great little breakfast spot for the quiet town of Milford. The blini and hash in particular were top-rate, and worth seeking out. I need to make it a point to come back and try their lunch menu, since I’ve been craving pierogi. Another one that we will definitely have to check out. Keep up the great writing!